Here are my entries for the month of March for Journal52. It's hard to keep up, but I keep pushing myself. 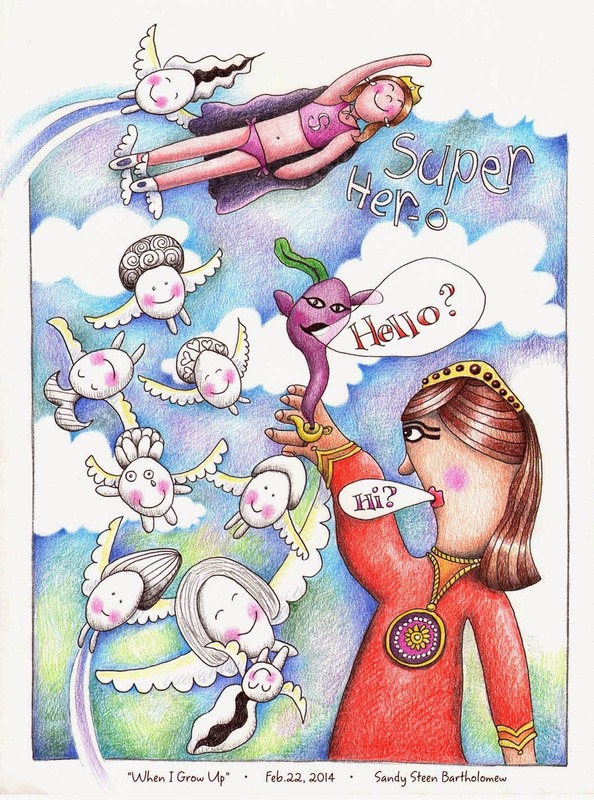 I am a little relieved that there is no assignment in the Lilla Rogers Bootcamp class in April since I will be teaching at TangleU and really need to get focused on that... and then I realized that Sketchbook Skool also is in April. Uh-oh. "Remember, Sandy, you choose to take these classes and you enjoy them." Repeat. Again. I saw an ad that used the colors red, gray and a smidge of yellow. All very unusual colors for me - so I created a journal entry incorporating those colors with a song that was stuck in my head. 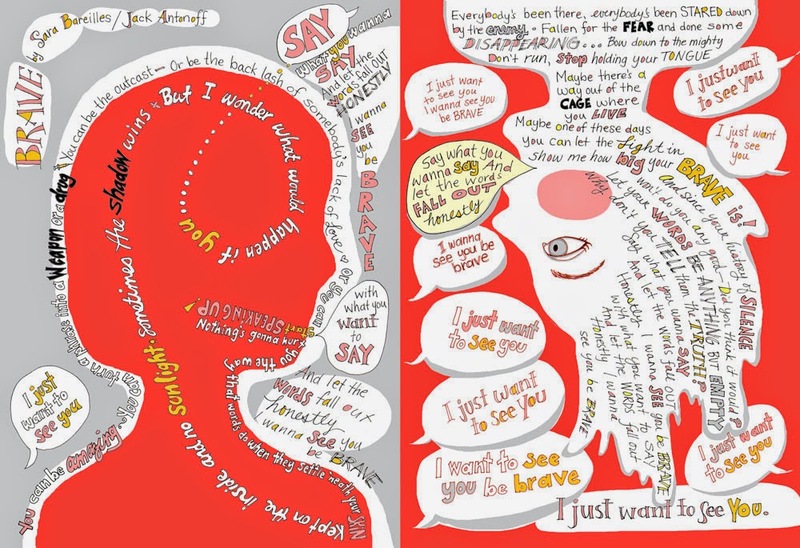 I feel so clogged up with thoughts and words that I just can't allow myself to say out loud. Things happen and I can't react or express my views. I am so afraid of what will happen and the few times that I speak out - when something just feels so wrong to me - I am "put in my place." How can my feelings possibly be "wrong"? Opinions and actions, ok, maybe those can be wrong... but "feelings"? This song is "Brave" by Sara Bareilles and Jack Antoff. Here is a link to the video on YouTube. I really love the words and it was actually cathartic to illustrate them moving around in these two pages. Four weeks ago when I created these two pages, I wanted to do a blog post explaining what was going on and why this song felt so important. Yep... I wasn't Brave enough to even post the journal pages. My "cause" is "speaking up." No, I don't seem to actually be doing it... but maybe thinking about it compulsively is a start? 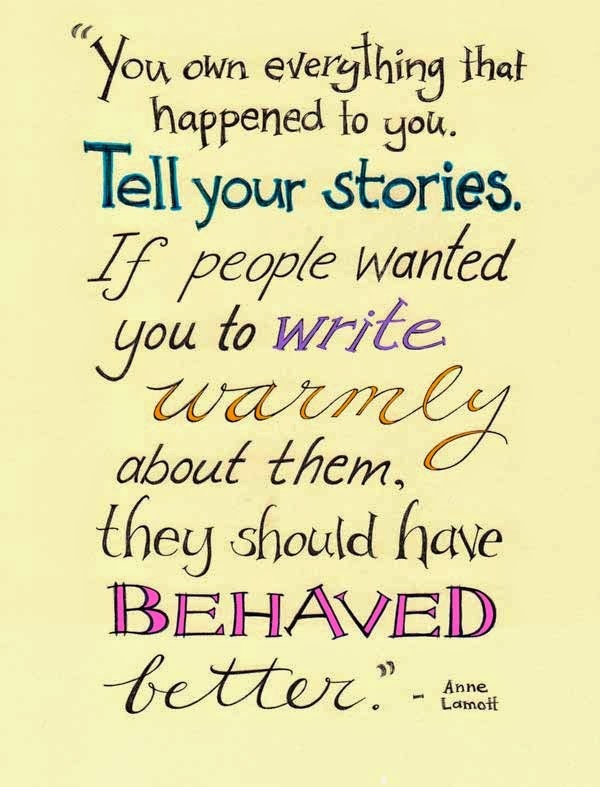 Since I had already used the perfect song for my cause the previous week, I agonized over what to do for this page, until I stumbled across this quote. Too perfect! That's it - I'm putting you in my novel! Ah, Something simple without so much angst. Phew. 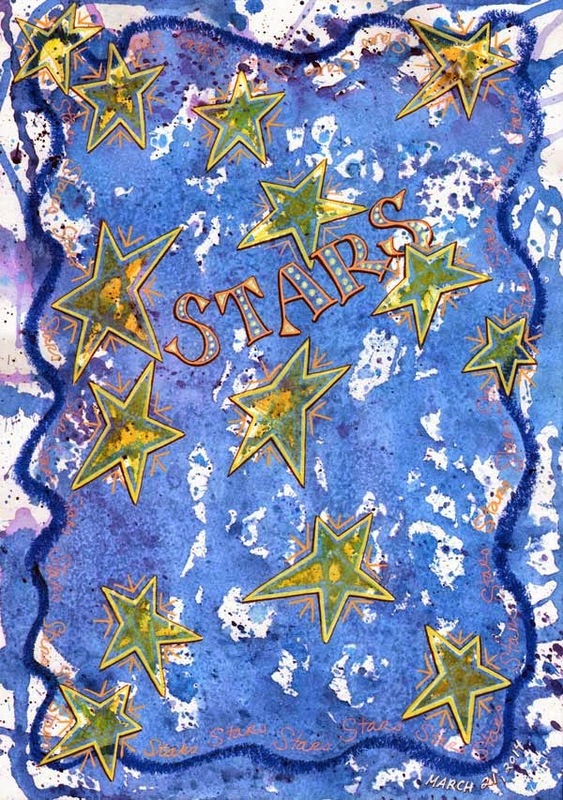 I used crayons to draw the stars and border. Dripped, splattered and drooled watercolors all over it, then added details with a Micron and some gel pens. Lesson learned: day-glo colors do NOT scan well. Instead of a specific day - I generalized - and then went with something a bit more symbolic. The waves are filled with all the "stuff" I do all day. The things that overwhelm and wash over me. The sky is full of how I want to Feel. This reminds me a bit of a stained glass piece I did years ago - a self-portrait - called "Head in the Clouds, Fish Out of Water." Except that I actually fit in here. I reread The Fire Starter Sessions: A Soulful + Practical Guide to Creating Success on Your Own Terms by Danielle Laporte, while I organized... and reorganized.. my studio. She is an amazing person and I highly recommend the book, but the most important thing I got from her book was about GOALS. We make the mistake of setting specific goals, like "I want to earn $50,000" and then we achieve the goal. But ... so what? We are still miserable. Danielle says we have to do it backwards. Decide how we want to FEEL... and then start doing things that make us feel that way. Duh. Right? That's why we can/will never finish our To-do lists and we never really celebrate our achievements and nothing ever truly makes us happy. Because our stated "goal" or resolution, or whatever we use for benchmarks is not our true intention. "I want to feel rich." Is SO different than "I want to have a million dollars." And then I can keep asking myself... "is this going to make me feel happy, connected... etc.?" And it really made me want to go to Maine and look at the ocean!! ;-) Because looking at the ocean in Maine makes me feel humble and calm and optimistic. 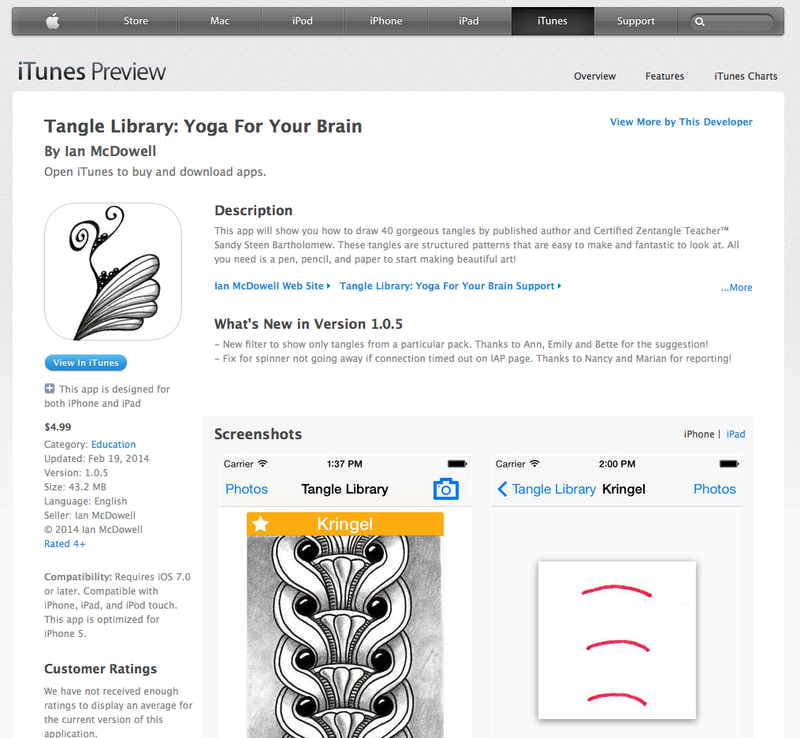 Tangle Library App is back up on iTunes and has a new filter feature! Due to popular demand, Ian added a filter that lets you sort by where the tangles originated. If you already own the App, be sure to "Update" it in iTunes to see the new feature. Just click the blue button that says "Open in iTunes" - or go to the store from within iTunes and do a search for "Tangle Library". If you are enjoying the App, please remember to leave positive feedback in iTunes. If you are NOT enjoying it, or have constructive criticism, please email Ian, the developer. Good ideas are always welcome for future updates. I am currently working on another set of 40 tangles as an IAP for Tangle Library. Yeah! If you have other questions about the App, they may be answered on the Support Page. 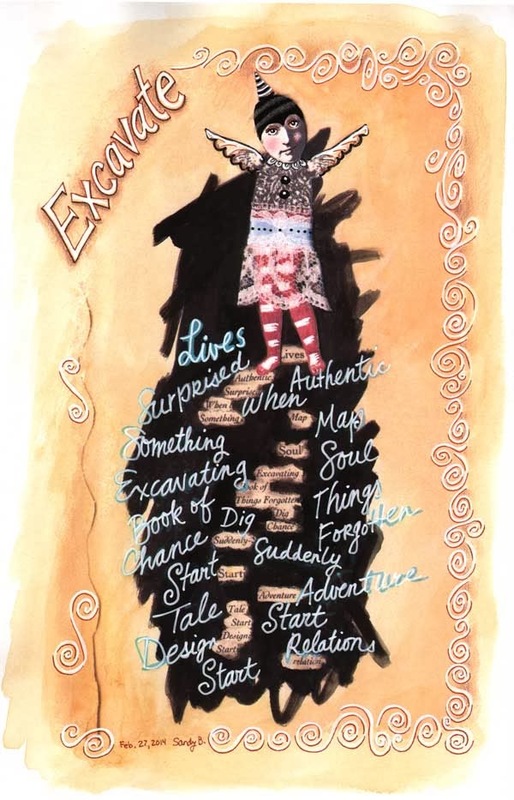 It's not fair to exclude the other Zentangle Addicts from having a trading card, so I created an adapted version for non-CZTs who love to tangle and attend Meet-ups, retreats, and classes. This one has "ZTA" instead of "CZT" over the photo on the front. ZTA stands for "Zentangle Addict" but it could also be "Zentangle Artist"... On the back, I removed the spot for the CZT training session number and the logo field. 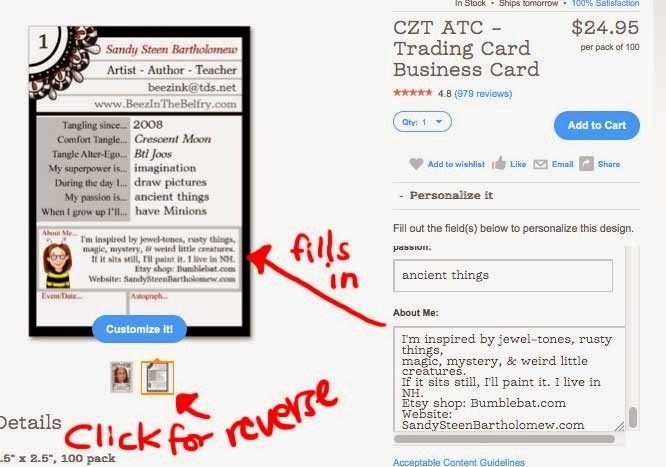 Everything else is the same, so you can follow along with the instructions in the previous blog post, CZT ATC, OMG. 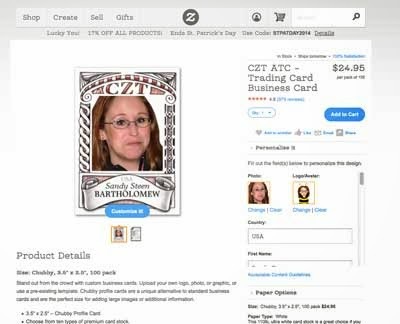 And click HERE to go to the ZTA template on Zazzle.com. Last year, at TangleU 2013, I had a Great Idea. Like most Great Ideas, it was born from sheer frustration. 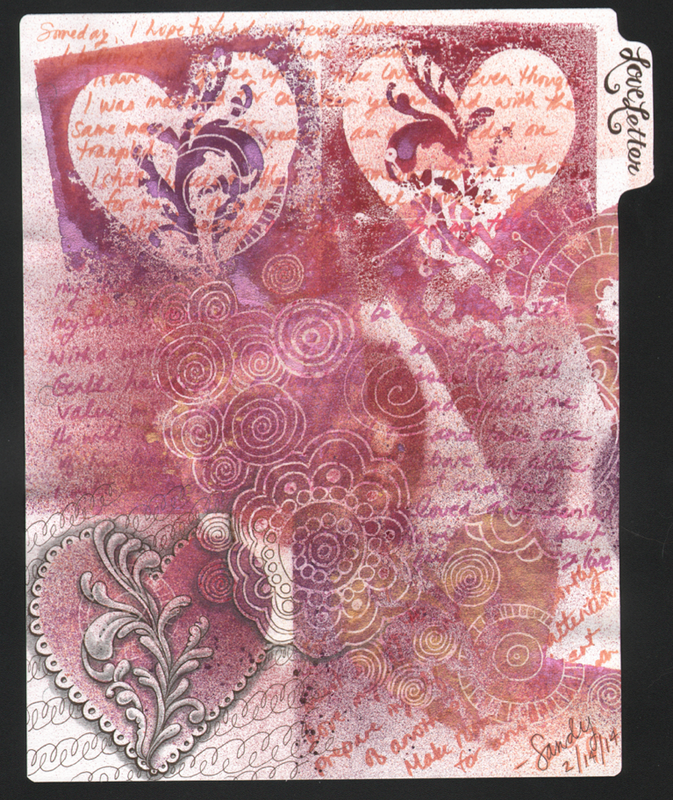 There were 60 attendees at the conference and many were folks I had met at other Certified Zentangle Teacher events, MeetUps, retreats, training seminars... I remembered some faces, but couldn't remember their names. And then there were all the NEW people I was meeting. Granted, I am an introvert at heart, but I was beyond overwhelmed. 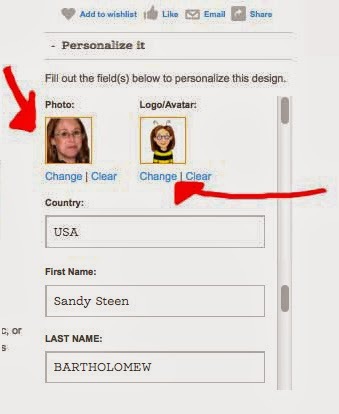 I need to see a person's face, with their name, AND know something about them that helps me put all the info together. 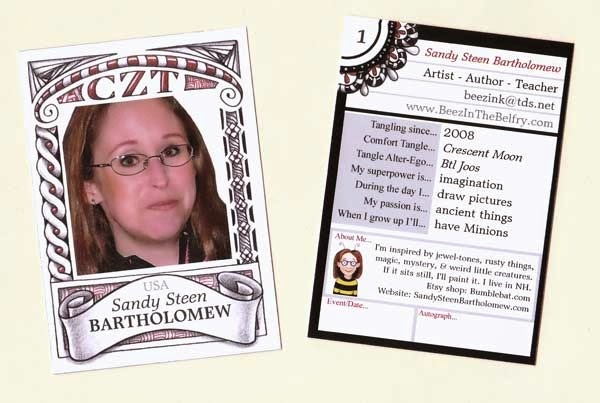 My Great Idea was to have trading cards for the CZTs! Not business cards - those are not very helpful for socializing. Good for networking and markeing a business. But I wanted a card to help me get to know the actual people. I love the concept of baseball cards - so I designed a CZT ATC that features the person's photo on the front and their "stats" on the back. Designing something for the first time can be a little scary, so I have step-outs below to guide you through the process in detail. Just remember that these are meant to feature YOU, not a product or business and also that they are "trading" cards. 1. When you click the link above, it takes you to the product page on Zazzle.com. You see that blue button that says "Customize It!"? DO NOT PRESS THAT! That allows you to mess with the text, fonts, positioning - which you can do later if you are graphically sophisticated. 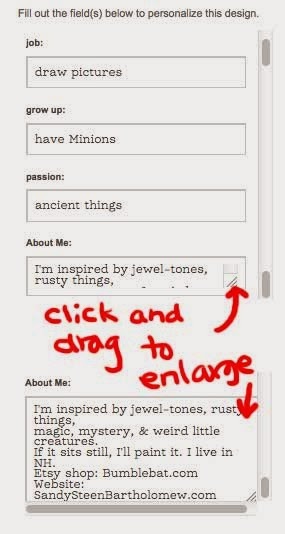 But to start with, the easy-peasy way is to just fill in the fields or text boxes over on the right side. All my info and pics are acting as placeholders, so you can get an idea of what to put there and then replace my info with yours. 2. First, replace the photo. You will want to have a great photograph of yourself (this is not Facebook, so please no photos of your kids or cat!) and that photo should be cropped into a square shape and saved as a jpeg. Right under my tiny portrait, on the right, you see "Change" written in blue. Click that, then find the photo on your hard drive and upload it. It should replace my picture on the front of the card. 3. 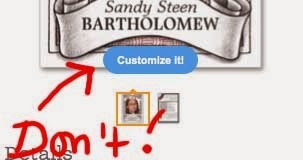 You can do the same with the "Logo/Avatar" image right now, or wait until later. This image will be tiny, but can be an additional photo or logo or cartoon or tangle or QR code... it will appear on the back in the "About Me..." section. 4. Then, just work your way through the text boxes beneath these pics. There is a scroll bar on the right, slide it down to see the rest of the fields to fill in. I'll go through each one to explain. Country: Use the abbreviation for whatever country you associate yourself with. First Name: Nicknames are fine. If you use a middle name, that can go here too. Last Name: This looks nice written in capital letters. 5. Underneath the image of the trading card you see two tiny pics representing the front and the back of the card. Go ahead and click on the reverse side picture. CZT #: This is the certification training seminar you attended in Whitinsville, MA or Providence, RI. The first thing that people seem to ask is "What session were you in?" This will go in the upper left corner. 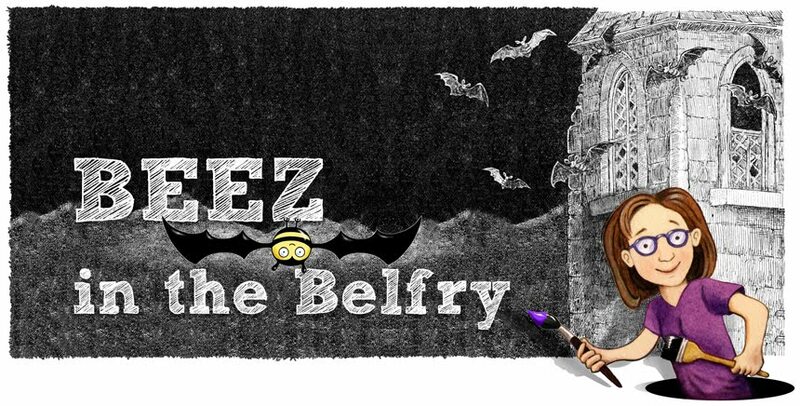 Full Name: If you used your nickname on the front, you can put your formal name here, or vice versa. 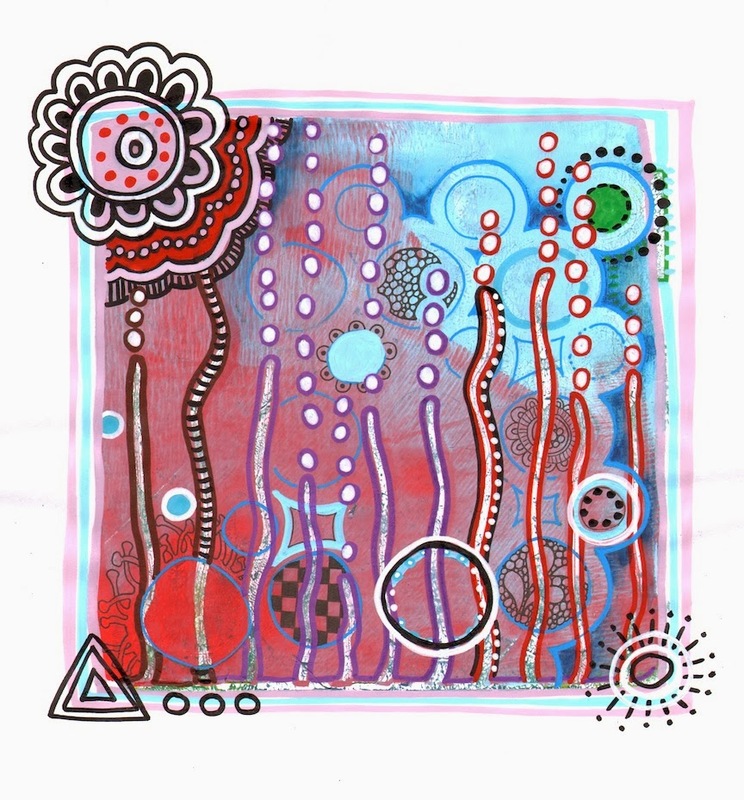 Skills: What is your focus with Zentangle®? 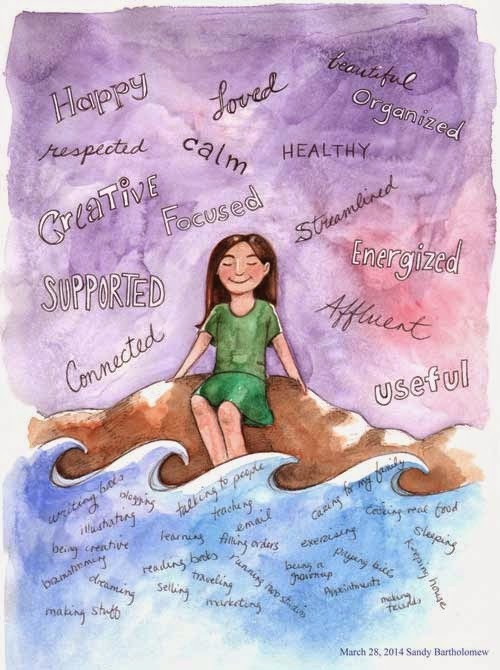 Some ideas are Artist, Author, Teacher, Therapist, Speaker, Blogger... pick your main ones. email: this could also be a phone number or Facebook link... any way that you prefer to be contacted. Web/Blog: If you have a website or blog, you can put the address for one here (others can go in the "About Me" section). You could also use this spot for a mailing address, or other link, instead. 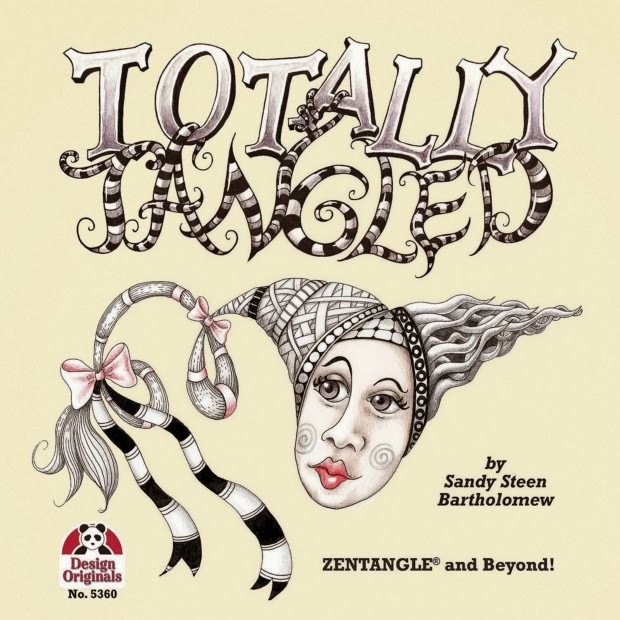 Year: when did you first start tangling? Tangle Name: What is your "comfort tangle"? When in doubt, what tangle do you turn to to get started? We all kind of lean on one or two tangles. superpower: What do you do really well? A talent you are proud of, or secretly proud of? It doesn't have to be "useful". Math? Knitting? X-ray vision? job: What do you do during the day? Work? grow up: Finish the sentence "When I grow up I'll..." What is your goal or your plan for the future? passion: What do you love? What makes your eyes light up and your heart beat faster? What could you talk about all day? About Me: Describe yourself. Anything else you'd like people to know about you. Other links or contact info can go here too. To see more of your text, grab the little triangle in the lower right corner and drag it to see more of the text window. The last two boxes on the back of the card are left empty so you can fill them in by hand once you get the cards. Autograph... you can sign your name here because that's what makes it an "authentic" Collectible Card! Use a permanent pen so it doesn't smear. Event/Date... This is where you can write in the event where you are exchanging cards. ie: "TU/2014" or "TangleU 2014" or "MeetUp 3/15/14" or "CZT#25" or wherever. Double check all your info, make sure it all fits and looks nice, then click the "Add to Cart" blue button near the top right. Also notice that there is usually some kind of a special code near the very top of the screen... in this case, it's 17% off for St. Patrick's Day. You'll want to enter that code in the discount box in your shopping cart to get your sale price. Zazzle also offers some really great email only discounts. My favorite, usually once a month or so, is a 50% off Business Cards deal. These ATC sized cards count as biz cards, so that is a fabulous deal! Here's my finished card! If you are going to TangleU 2014, I hope you will trade cards with me. :-) There will be over 100 people at this year's event, so I REALLY need these cards. I had ideas about doing something with archaeology or kids' books. But the more I thought about it, the more I realized I am doing exactly what I always thought I would do, but also things I never believed were possible. Drawing pictures for kids is pretty close to drawing pictures with kids, right? My daughter, Lilah, and I have been doing a lot of drawing together and her ideas are usually spot on. This sketch was a "back and forth"drawing. She draws something, I add to it, she responds... we try to out-do each other. ie: She was annoyed that I drew fingernails on her hand because it was supposed to be holding the genie's lamp - and I messed it up so it made no sense! oops! I added little lines to turn the lamp into a "ring" on her hand. OK. That could work. I added the color with Prismacolor pencils. Lilah: How long did it take you to learn to color like that? Lilah: But you're older than that! Sandy: The first two years, I just chewed the crayons. Although I have done a few pieces like this in past journals, I didn't know it had a name until I discovered Austin Kleon. And now I see found poetry showing up everywhere. Even the CZTs have been playing with it and Zentangle. Cool. This piece goes well with my theme for this year - and I will do another post about that, soon. I transferred the book page to paper with Sheer Heaven, used gouache for the black outs and background, paint pens for the words and swirls, a Zettiology stamp for the girl - with lots of altering and lace, and some Micron pens for details.